Sieve the flours together in a large bowl and make a dent in the centre. Heat the milk and water little(luke warm) and add sugar,yeast to it and mix well to dissolve yeast completely. Optional step if you are not sure about the yeast quality: Proof the yeast before using in the recipe. Yeast smell dominates because it have not worked properly in the dough. So first mix and dissolve yeast completely in luke warm milk +water + sugar. It should be luke warm, not hot, otherwise you may kill the culture. Once completely dissolved, keep aside for 5 to 10 minutes. It should raise and become frothy. Now, use this to make the dough. If the milk doesn’t raise or froth, it is not active yeast, it will not give good results, so better change your yeast, always use fresh stock. Pour this mixture in the dent, add olive oil,salt,chopped garlic,coriander and the chilli flakes and gather to make a pliable and loose dough. Apply oil over the dough and cover the mouth of the bowl with a cling wrap with enough room for the dough to rise.Keep in a warm place for an hour. After an hour the dough should have raised well(refer picture). Punch down the dough and make six equal sized balls and arrange it in a greased baking tray. Pre heat the oven to 190oC . Till then the dough balls we have made will again rise a bit. Brush the buns with milk and bake the buns at 190oC for 13-15 minutes or untill the top starts turning golden colour. Brush again with butter on top..
and enjoy with butter when its still warm!! The dough should be very pliable and soft,if its stiff and tight you may not get soft buns. If your dough doesnt rise then your yeast is not active,you may not get soft buns either. Tastes and smell great even after cooling down. You can add along chopped green chillies too for extra hotness! Oh Raji. Same pinch. I made them last week and the kids loved it so much. Yet to post though. Love your step by step pictorial. Looks very tempting….Fluffy and soft buns, have come out super good! Looks tempting and too good. Love the idea. what a recipe. am going to make it asap. This is my fav bun from my childhood days. There is a famous bakery near our locality(in Kerala) which sells this…whenever I visit India this is my first thing to have from that bakery..I have tried it once and will post the recipe soon… Only some slight changes in the recipe.. ur khara buns looks simply drool worthy…I am drooling….slurp..wish I could grab a few…Any ways few more days to go…I will go directly to that bakery from the airport…hahahaha…ur clicks are so superb especially the first one…love it. Love love them, till now i have not made any savoury breads, i would love to makes once a filled one, these look absloutley perfect and yumm. They look extremely soft and kara buns were my staple sustained food during pregnancy:) I do not need excuses to bake them, but I do have one now! That I am longing for them looking at your pictures is reason enough to bake them soon! Absolutely delicious and perfect buns..looks fabulous. Coincidentally, only yesterday I was planning to make some khara buns and now here you are with these perfect buns ~ looks splendid! 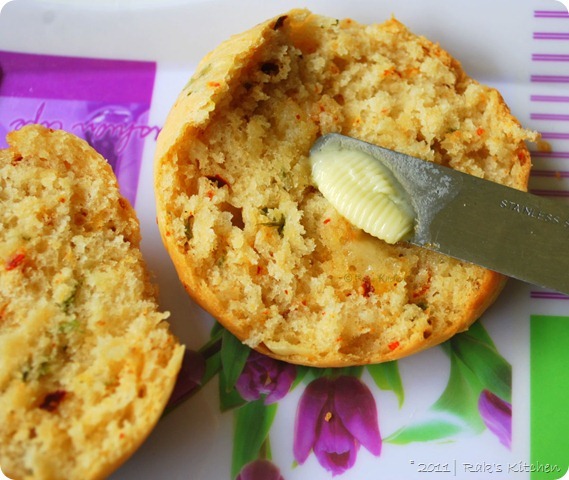 Prefectly baked buns, simply inviting..
Love anything savory .. got to try this out. they look so cute and yum!! loved the recipe..nice clicks..looks so yummy!! Perfect buns…Love the colors and texture.. Perfect khara buns….super soft and yummy!! khara buns looks awesome perfect. wow that look so tempting. love them at the bakeries. Perfect snack.. Should try this for sure.. These buns brings back so many memories of Bangalore bakeries !Looks beautiful Raks and would love to have this snack along with tea. looks gorgeous, I've already made those savory buns from ur blog, and again this one is also bookmarked..Thanks for sharing raks.. This should make a perfect snack with tea. Bookmarked! Hey Raji, now that I've got the hang of baking breads 😛 would love to bake these..am bookmarking these:P thanks. Delicious buns!! Loved the pics too..
Its tea time in Chennai…kara buns and tea would be perfect.Wish I could have some right away.. I started a blog recently. Kindly take a look at it when you get a chance. this is one gorgeous buns..the flavors are just amazing..
Never tried buns savory before–sounds like a great idea! Lovely and tempting clicks!! 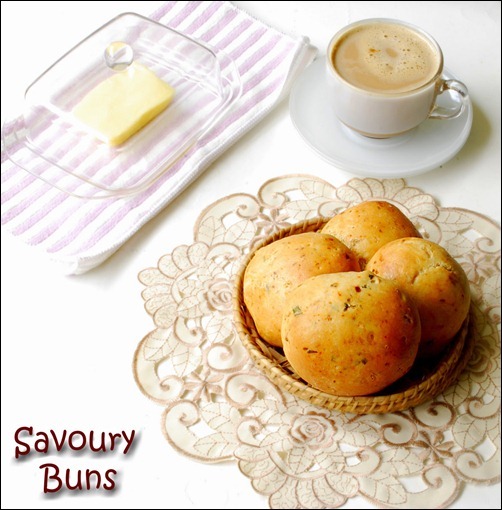 Perfectly baked buns,luv the savory version…thanks for the recipe. Wow Raks..you've become a pro in baking now! !Khara buns look inviting!! wow, the buns look lovely, I love baking khara buns in the way we bake in our bakeries check out on my blog sometime when you have time, nothing special we add dill leaves, onions and chillies. try proofing the yeast,i.e; keep the yeast mixture after step 1. If it rises, then ur yeast is active and buns should come out good. Did your dough raised properly? For all those having an issue with the dough not rising, try proofing it in the oven (preheat at 175 F for 5 mins and then switch off) and place a big bowl of boiling water at the bottom of the oven. This increases the humidity of the oven helping the dough to raise. I live in NJ and was having trouble with rising until i tried this method. Kamini, thats so sweet of you to give the feedback and a trouble shooter too 🙂 Love you! Can you give some general tips for baking? 1) Should everything be baked in the lowest rack possible? My lowest rack would be say 1 inch from the bottom of the oven. I always have a doubt if I can use that or raise it to the next rack which would be 3 inches from the bottom. 2) Do cakes, pizzas, cookies, buns etc need to be baked in the same rack? Mine doesnt have any rack , so i keep at the bottom only. But my friend has OTG and she bakes all in middle rack. Sometimes in upper rack for cookies she said. Hope this helps. Seeing this recipe i need to buy the oven and start baking , can u pls suggest the type of oven should i buy. where can i get yeast from? How can i use the instant yeast in this recipe? Hi, I wanted to know if we can refrigerate the dough and use it next day morning.. Yes cling wrap it to refrigerate. Next day bring to room temperature and let it raise. Then proceed as mentioned. Since garlic is there, not more than 12 hrs. how many days is the shelf life for these buns?after baking?? 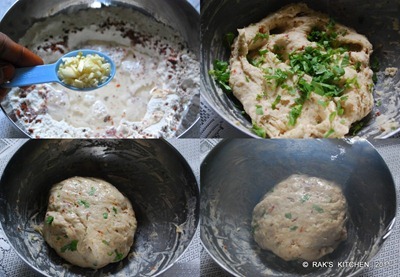 Hi, vry nice recipe…..I have a question , no need to knead the dough for 8 to 10 min? Just combine all the ingredients together like chapati dough ? I'm fan of your recipes. When ever I prepare bread items yeast smell is dominating even after baking? How to overcome from it can please give me some suggestions. Proof the yeast before using in the recipe. Yeast smell dominates because it have not worked properly in the dough. So first mix and dissolve yeast completely in luke warm milk +water + sugar. It should be luke warm, not hot, otherwise you may kill the culture. Once completely dissolved, keep aside for 5 to 10 minutes. It should raise and become frothy. Now, use this to make the dough. If the milk doesn't raise or froth, it is not active yeast, it will not give good results, so better change your yeast, always use fresh stock. Made these today & they turned out yummy.. I didn't get the texture though.. It was pale yellow.. Soft & cooked… Forgot to brush milk before baking but tht was the only variation from ur recipe… What could have gone wrong? This one sounds good of making bun by ourselves. Is it compulsory to use olive oil? or we can use our regular veg oil? Sure you can use other oil or even melted butter. Hi, I love your blog, especially, because u explain, step by step, with pictures. I wanted to know whether I can double this recipe? If so should I double all ingredients, esp, yeast? Thanks. I bought all the ingredients to try this. But how many grams is your one cup? My cup holds 240 ml of liquid. Hi ur blog is so nice because of ur step by step pictures. I tried ur Kara bun came out very well in texture and taste but I didn't get the golden brown colour on the top. I don't know what went wrong. I didn't forget to brush with milk also. Please reply. Thank u very much. Happy cooking. Try proofing the yeast. That is prepare the yeast liquid by dissolving yeast in luke warm water, sugar and milk as per the measurement. Keep aside for 10 mins, it should look frothy and raised. Then your yeast is good and can proceed to the recipe (use this to knead dough). If the solution remains plain and look same, yeast is not good and you cannot get good result with that. hope this helps. Thank you for your recipe.I tried it out and my family enjoyed it.Another day,I tried the buns adding some oregano and chilli flakes instead of coriander and chilli flakes.It was too good.Thank you once again.